Because Chongqing used to be a part of southeast Sichuan, the city is quite famous for its spicy Sichuan cuisine. However, Chongqing is most famous for its signature hotpot dishes. Each table at a Chongqing hotpot restaurant features a pot in the middle where the diners boil the food they order in a spicy broth. Common types of food used in these Chongqing hotpot dishes are beef, pork, and vegetables, but other more exotic types of food are often used as well. Other common cuisines and types of foods found in Chongqing include spicy pork, fish, beef, chicken, rice, veggies, and noodles all prepared in different, interesting ways. The weather in Chongqing China is usually on the warmer side. The best times to travel to Chongqing are Spring and Winter, when the commonly warm climate offers a welcoming temperature and mild weather. With water close by, the city of Chongqing often has high humidity and usually features an overcast sky. -The Jialing River meets the Yangtze River in Chongqing, giving you a unique opportunity to see China from a unique perspective. Riverboat tours of the Yangtze River begin in Chongqing and will open your eyes to a whole new world. You can enjoy a river cruise, a tour boat ride, or even a cable car ride in Chongqing. -The People's Liberation Monument, which used to be the tallest building in the city, is a monument designed for the victory over the Axis Armies. 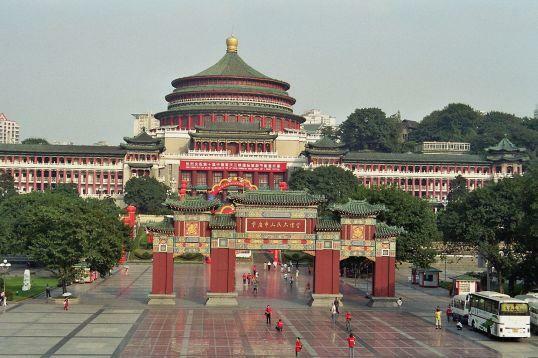 This monument is surrounded by shopping centers and is a perfect destination for a day in Chongqing. -The Dazu Rock Carvings is another historical wonder to visit, just a few hours outside of Chongqing. It is a series of sculptures and ancient carvings that can be dated back to the 7th century. There are over 70 sites in the Dazu Rock Carvings, displaying some of the most interesting physical history in China. -Fishing Town, also known as Fishing City, is another famous historical site you can enjoy with women from Chongqing on your romance tour. It is one of only three ancient battlefields located in China. -The Three Gorges Museum is one of the largest monographic museums and helps to preserve the cultural elements of Chongqing. Here you can enjoy paintings, sculptures, calligraphy, coins, and other cultural artifacts and pieces that represent the life of Chongqing and the Three Gorges area. Admission is free, so spend a day there with one of the beautiful Chongqing women and learn a bit about the city and its history. -The Three Natural Bridges is one of the world's natural wonders and one of Chongqing most exciting sights to see. These three bridges make up the world's only group of structures naturally created through the dissolution of bedrock. -The Three Gorges Dam, spanning across the Yangtze River, is the world's largest capacity hydroelectric power station and is one of Chongqing's most amazing sites to see.